$16.70 NOTE: Our shopping cart is disabled. We are using it to display affiliate items which if you click on PURCHASE in the PRODUCT INFORMATION by scrolling below or click on the Amazon banner the RRDi receives a small affiliate fee upon completion of your purchase. Mahalo. Purchase. Dr. Eric Berg recommends grapefruit seed extract oil for rosacea. 4:1 PURE EXTRACT STRENGTH; HIGHEST DOSAGE ON AMAZON Made from pure grapefruit seeds at an extract strength of 4:1, each capsule is derived from 2,800 Mg of pure grapefruit seeds. 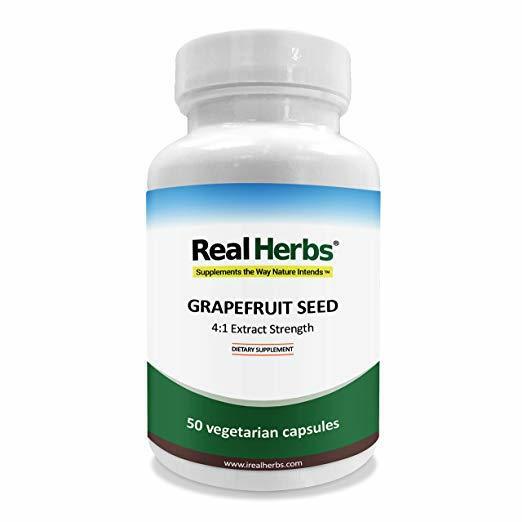 Real Herbs brings to you 700mg of grapefruit seed - the highest dosage per capsule on Amazon - for potency and efficacy. PROMOTES IMMUNE HEALTH; ANTIOXIDANT SUPPORT Real Herbs Grapefruit Seed Extract is rich in nutrients and phytochemicals. GSE Grapefruit Seed Extract is also a rich source of plant antioxidants including hesperidin, vitamin C, sterols, tocopherols or vitamin E, citric acid, limonoids, and trace minerals that help support antioxidant activity against free radicals. These antioxidants naturally help stimulate the immune system. PROMOTES DIGESTIVE HEALTH Real Herbs Grapefruit Seed Powder helps promote digestive health by reducing digestive disturbance. Grapefruit Seed pure extract helps reduce pathogens especially fungal pathogens in the gastrointestinal tract. It also reduces the risk of constipation, flatulence, and abdominal discomfort.